Salt has suffered a bad reputation for years, and even today remains an ingredient to avoid when meal-planning. However, Canadians can now benefit from another use of salt that has flourished in other parts of the globe: salt therapy. "It's great for people with respiratory problems and we were one of the first ones in Canada to have that kind of facility," says Magda Rutkowska from Salt Cave High Care in Mississauga, Ontario. The air in a salt room is drier than that of most parts of Canada. Humidity can range from 30 to 60 per cent, and temperatures from 18 to 24 °C. Clients wear booties to protect their feet and keep the salt clean. Many salt therapy centres have separate treatment rooms for young patients where they can play in the salt or enjoy books and toys. Since Roman times, improved breathing after working in salt mines has been reported. Polish doctor Felix Boczkowski first recorded the benefits in 1843, and shortly after, a spa was created in a mine. In 1987, the first manmade salt spa was created in Russia. Salt therapy has been commonplace in Europe for decades, but is fairly new to Canada. The limited number of salt therapy centres in Canada inspired Jenny Hecht to open Salt Therapy Breathing Centre in London, Ontario. "There are so many Canadians that unfortunately suffer with some sort of breathing issue. We wanted to open a centre that offered people a choice in how they choose to manage their respiratory symptoms," she says. Salt therapy is completely natural and non-invasive. It can treat many illnesses, from the common cold to chronic respiratory ailments. It can enhance athletic performance as salt increases oxygen levels in the blood, reducing fatigue, and speeding recovery. Regular sessions are recommended for maintenance. There are multiple options when constructing a salt therapy centre. 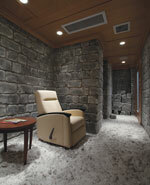 Speleotherapy uses natural salt blocks from mines, mimicking natural caves. It is more natural, but facilities are more expensive to construct. Speleotherapy has a lower concentration of salt particles than halotherapy, but they can penetrate the lower respiratory system whereas with halotherapy, the particles are too large to do so. Halotherapy uses halogenerator machines to create dry aerosol by crushing pharma-grade salt grains into particles one to five micrometres in size. It may not be suitable for people with high blood pressure as salt is ingested as well as inhaled. Healthy Breathing Centre in Langley, British Columbia, features individual treatment rooms as it uses BTP generators, a type of halogenerator where salt particle size and quantity are predetermined for each ailment. Each type of salt has distinct benefits, so Salt Cave uses a variety. Dead Sea salt, good for fighting infections, covers the floor. Himalayan salt is among the world's richest, containing about 80 minerals. Saline brine from Poland helps maintain the microclimate. Iodine-rich salt is brought in from Klodawa, a mine in Poland. Adding salt to your menu? Though Rutkowska and Richard Zagrobelny from Iris Wellbeing Halotherapy Spa in Waterloo, Ontario, agree it is a great idea in theory for traditional spas to offer salt therapy, it is not always feasible. The salt room must be well ventilated and separate to ensure chemicals do not enter and make the air impure. Hecht agrees and does not recommend combining the two. Also, Zagrobelny and Rutkowska both noted that other services they offer, such as reflexology and yoga, do not always have the same clientele as the salt rooms. Any spa can offer salt treatments without spending time and capital on special facilities. Salt scrubs, organic salt facials, or body peels with Dead Sea salts are easy to offer. Spas can sell salt products such as lamps and inhalers. The lamps cleanse the air and protect the body by neutralizing the positive ions from computer and television screens. Inhalers are an alternative for those unable to visit a salt room. Rutkowska tells people interested in opening a salt therapy centre to be courageous. "This is the future, I think, for treatment of respiratory problems," she predicts.